Brian Keeler has been periodically teaching residencies at area high schools as a rostered artist through the Pennsylvania Council on the Arts (PCA) since 1998. Those members of high school art faculty that are interested in pursuing his portrait, landscape or still life painting workshops should contact the artist at bkeeler@epix.net. For more information on the program, contact Brenda Thomas at the Bradford County Regional Arts Council (BCRAC) in Towanda, PA at brenda@bcrac.org or info@bcrac.org. 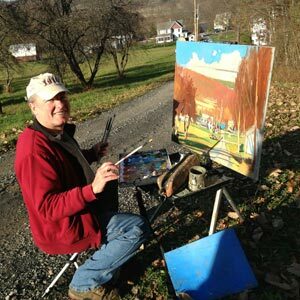 Brian, on occasion, has given weeklong painting intensives in the figure and landscape in his hometown or during weekend workshops for various art clubs. Along with these he offers lectures on Renaissance art and his experiences painting and traveling in Italy. Over years he has conducted numerous ten day and two week long painting workshops and cultural tours in Tuscany, Umbria as well as visiting many other cities with the group. For info on the next trip please cal the artist at 570-746-1187 or bkeeler@epix.net.